I don't think there's anything that changes quite as much about a face as the fringe. A straight one, an asymmetrical one or none - it does make a change. That's why there are different fringe types for different face shapes. If you have a small forehead, bangs may look weird on you whereas if you have a round face, a rounded fringe may reinforce that look. I am not going into detail on this as all women's magazines on this planet surely already wrote an article on that topic. What I'm gonna do however is tell you about my fringe routine and give you all the tips I know to rock them bangs! Hairdressers are really peculiar natures and they definitely have another comprehension of the term "short" than you do. Whenever I asked my hairdresser not to cut my fringe too short I would end up with what felt like baby bangs. Therefor I rephrased my hairdresser formula from "not too short" into "the bangs should still be long enough to cover my eyebrows". Most of the time it works so I'm not afraid of getting my fringe cut anymore. While washing your hair I'd recommend not to use conditioner on your bangs as they'll get greasy quickly enough. When it comes to the styling itself it depends on the fringe type you chose but a hairdo with a fringe will necessarily need more styling than one without. 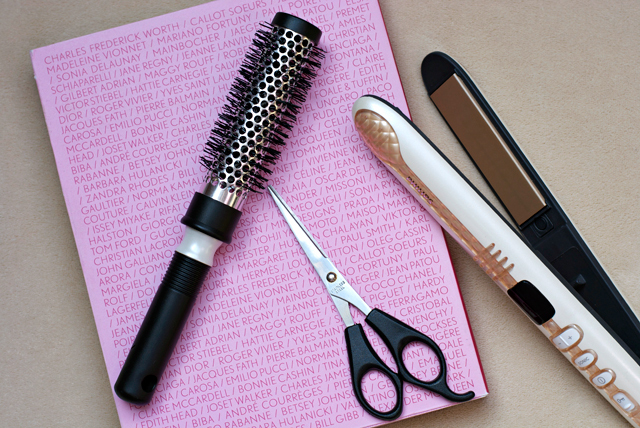 For a straight fringe blow-drying your hair (with a curler brush!) normally won't be enough as it tends to look really frizzy. Therefor my (not so) secret weapon for a pretty fringe is the straightening iron. It makes the fringe more shiny and voluminous and I use it to give my fringe ends a slightly round finish. Like that it looks more natural and stays in shape. As I already mentioned bangs get greasy quite easily so you might need to consider to wash your hair more often if you have a fringe. I get along with washing it every other day but I might need to use some dry shampoo after long and busy days. The best thing you can do to keep your fringe looking good is not too touch it too often and maybe also use mattifying face powder on your forehead from time to time. This actually reminds me, I need to trim my own. It's overgrown to the point now that it parts to the side lol. I've been so lazy though. I used to get a fringe once in a while but each time I get tired of it and let it grow. Haven't had one for years now; might get one later this year. You're really making me think about getting a fringe... Love these tips.